So I just updated to thrive architect from thrive content builder but unfortunately whenever I created a new page or edited an existing one the thrive architect hangs...the page remains greyed out with the 4 or 5 dots/drops constantly animating. Turns out the solution was a very simple one, I simply needed to also update the Thrive theme i was using. Now all is well and i am able to publish this post...obviously my first using the new thrive architect editor. I had actually been putting this off for a few days, as i assumed I would need to find out / remember my thrive login details then download the plugin. ...then remove the old content builder plugin and install the new Architect plugin...I'll be honest I also thought there might be a trip to my hosting backup functionally to restore a previous version, due to something going wrong. ....well how wrong i could be, I logged into my WordPress account, hit update on the content builder plugin and hey presto it was updated to thrive architect. As discussed above the only issue I had was forgetting to also update the squared theme. But once that was done all was good. My first impressions are that this is amazing, I liked the previous version but there was a few things that made it a pain to use. It was much better than the basic wp editor but still caused me some issues that forced you to do things in a specific way. For example pressing enter key within a paragraph/text element used to create a whole new text element. This meant if you wanted your text all in the same element you had to remember to hold down the shift key. I can happily report Thrive Architect does not do this, pressing enter creates a new paragraph but within the same element and using the shift key moves only the next line i.e. ...just pressing enter without the shift key pressed. This might seem like a small thing but it used to cause me all sorts of issues especially when pasting text into the editor. LOOP at itab where condition 1 or condition 2. This is not a full thrive architect review but my first impressions are that this is actually beautifully done, and apart from the custom code issue everything seems to work as you would expect it to. You create a paragraph and enter your text as you would expect, and no random elements are created. The menu on the left is also so much cleaner. I have just found what looks like a very useful feature without even trying, with the previous version i'll hold my hands up and admit I didn't really know what most of the options did and kept forgetting how to access features I had previously used. 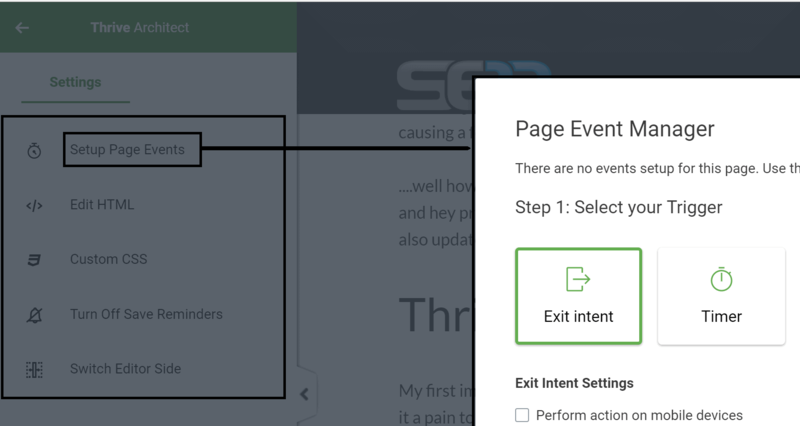 ...and found a section that allows you to add page events i.e. when the user wants to leave the page or after a certain amount of time perform a certain event . I'm sure this existed before but I never found it. To be honest I never looked but I have only been using this for 20 minutes and have found so much more...Maybe as I use it more I will find things missing but so far the ease of use is so good that I could handle a few things missing. If anyone is reading this I have Grammarly installed on my chrome browser and if there was a way to allow that to access the text within these input sections that would be awesome. The last thing I will point out is that thrive architect allows you to see what your page looks like on different devices i.e. desktop, tablet or mobile. 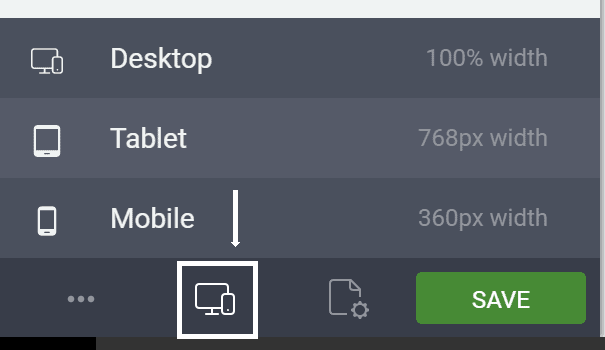 Simply click the Responsive view icon in the bottom left hand corner and change the device. Note you can change the size of the text within each of these views and it will only be effective for that device screen size or smaller.